The 2019 UCLA Festival of Preservation opens at the Billy Wilder Theater in Westwood this Friday morning, February 15th, at 9:00 a.m.
As I shared last month as part of a news link roundup, this year UCLA's biennial festival has a new format. Rather than a series of screenings spread over a month's time, this year's festival will be compressed into three days, February 15th-17th. Screenings will start at 9:00 a.m. each morning and run into the wee hours, with the latest screening on the schedule starting at 11:20 p.m. on Friday. 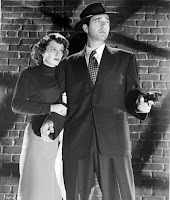 I will be attending a pair of screenings on Friday, THE CROOKED WAY (1949), a John Payne film shot by John Alton which I reviewed in 2013, and THE MORTAL STORM (1940). THE MORTAL STORM stars James Stewart, Margaret Sullavan, and Frank Morgan, who all appeared that same year in THE SHOP AROUND THE CORNER (1940), as well as Robert Stack and Robert Young. Payne is seen here with Ellen Drew in THE CROOKED WAY. 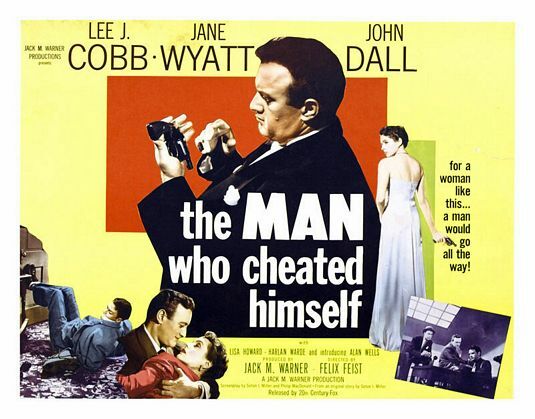 Other interesting films showing this weekend include THE RED HOUSE (1947) and THE MAN WHO CHEATED HIMSELF (1951). 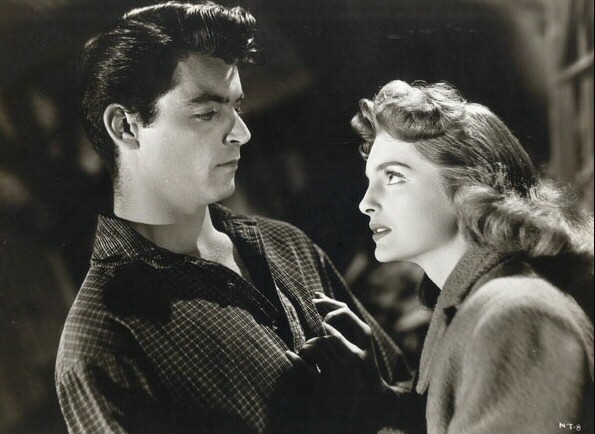 Rory Calhoun and Julie London are seen here in THE RED HOUSE. I was fortunate to see the world premiere of the restoration of THE RED HOUSE last year at the Arthur Lyons Film Noir Festival, and I also saw the new print of THE MAN WHO CHEATED HIMSELF at that festival. 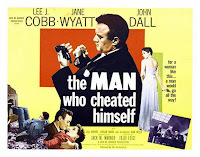 The Film Noir Foundation's Alan K. Rode, host of the Arthur Lyons Film Noir Festival, will be on hand at the Billy Wilder Theater to introduce THE MAN WHO CHEATED HIMSELF. 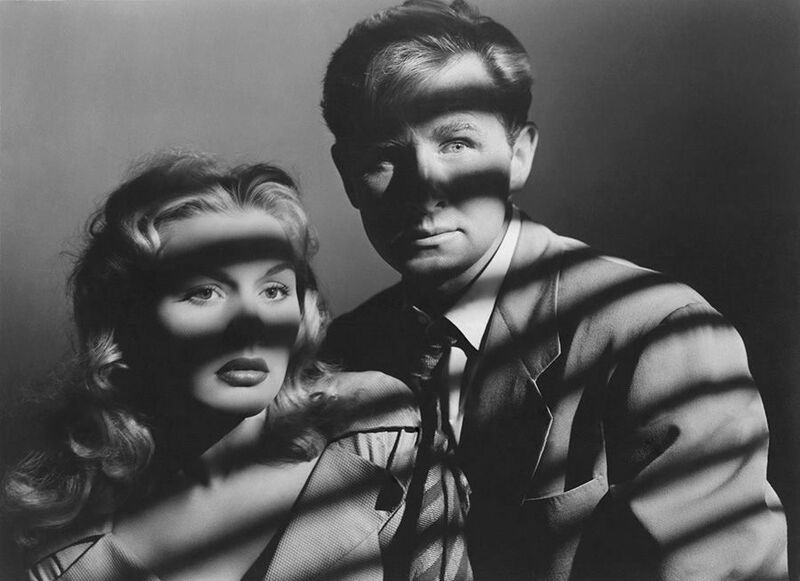 Alan will also introduce Lloyd Bridges and Barbara Payton in TRAPPED (1949), pictured here, which I'm anticipating will also be shown at the Noir City Hollywood Festival in March. The complete schedule may be found at the UCLA Film & Television Archive website. I'm curious how the new festival format will play out. I've really enjoyed attending the similarly formatted Cinecon the last couple years but feel that festival is somewhat more conducive to an all-weekend format; the Cinecon movies, generally from the silent era through the '50s, all seem geared for the same audience, with most of the films holding considerable appeal for me, and the titles are obscure enough that it's unlikely an attendee would have seen most of them. I saw a dozen films at Cinecon last year and all but one were completely new to me. The UCLA Festival mixes everything from silent shorts, animation, Spanish-language horror, and film noir to newer films like OPERATION BOOTSTRAP (1968), GAY USA (1978), THE KILLING FLOOR (1985), and THE HOURS AND TIMES (1991), which are far outside my classic film era "wheelhouse." I wonder if others will feel the same or enjoy the ultra-diverse lineup! Late start times such as 11:20 p.m., 10:20 p.m., and 10:11 p.m. are also not workable for me, commuting from Orange County. I have also typically skipped the latest start times at Cinecon for this reason. As a side note, on Saturday afternoon, February 16th, I'll be at the Autry for a screening of THE TALL T (1957) hosted by Jeremy Arnold. We are truly fortunate to have so many wonderful classic film opportunities in the greater L.A. area. Update: Here's a preview of the festival by Kenneth Turan at the Los Angeles Times. Updates: Weekend Movie Fun: Out and About in L.A.; Tonight's Movie: The Mortal Storm (1940) at the UCLA Festival of Preservation. A look back: The 2011 UCLA Festival of Preservation, The 2013 UCLA Festival of Preservation, The 2015 UCLA Festival of Preservation, and The 2017 UCLA Festival of Preservation. Sounds like you have made excellent choices and will have a wonderful time. It is nice to hear of the restoration of The Red House. It's about time! I am jealous of The Tall T screening. I wish you could be at the TALL T screening!!! THE RED HOUSE looks so great now. Hopefully this new print will be released on DVD.